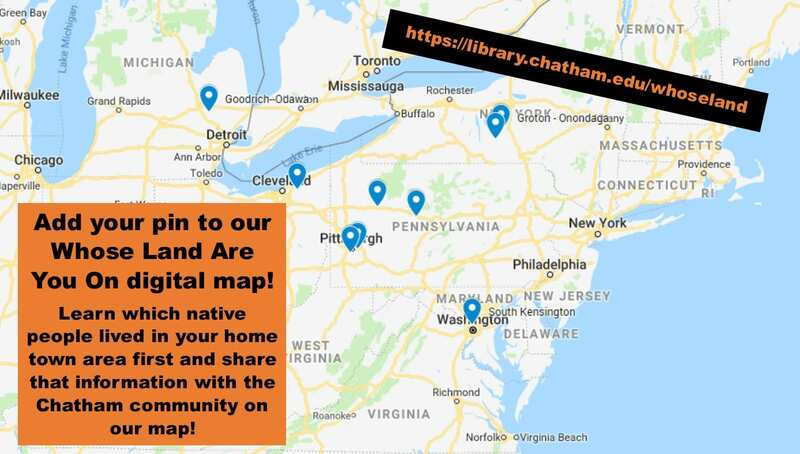 This November, the JKM Library launched a crowd sourced digital mapping project called “Whose Land Are You On?” in honor of Native American and Indigenous Heritage Month. We have a couple of goals for this project, which will be ongoing and updated throughout the years. First, we wanted to document where people in the Chatham Community grew up or considered their childhood home so we can see how far we’ve all come from. We then wanted to help the Chatham community educate each other on which indigenous people call/called that land home before being pushed out. We also aim to generate awareness around indigenous culture and the devastating effects of colonialism. Ultimately, we hope to honor those indigenous people and help stop the erasure of their presence from their own land. So, how does this digital mapping project accomplish all that, and how can you participate? We are using two digital tools to build our own map: Native Land and Google’s My Maps. Native Land is a project originating out of Canada and run by Victor Temprano as an engaging tool for awareness and advocacy. It is a dynamic project and comes with the caveat that it may contain inaccuracies. Victor acknowledges the maps many flaws in theory and in practice, but its intention is education, and that is how we are using it with this project. My Maps is a great tool from Google that allows us to create our own map with custom data. Anyone can access it and contribute to the map with their data. To participate, you first look up your home town on the Native Land map. This website will tell you the different Native and indigenous people who lived on that land. You then will want to go to our My Maps map, look up your home town again, and then drop and edit a pin in that location! We ask that you insert the Native tribal information into your pin so that others visiting the map will be able to see who called that land home before the colonizers. For in-depth instructions and images, please visit our guide at https://library.chatham.edu/whoseland and contribute a pin of your own! Once you are done adding your pin, you can return to Native Land and take advantage of the informational links they offer on the Native tribes that pop up when you searched your home town. Click on those links and take 10 minutes out of your day to read up on them and their culture. Take that information with you as you head home for Thanksgiving, and tell your family about the people whose land you are on. Thank them for being the stewards of that land, and talk about what you and your family can do to support them now. We encourage everyone from any part of the Americas to participate! That includes Canada, Central, and South America. And don’t forget Hawaii! Native Americans are not just indigenous folks from what we now call the United States. Borders have a habit of tripping us up, but if you are from a part of the world that has been documented by Native Land, please feel free to add it to our map. We will continue to ask the Chatham community to add to and browse this map in years to come. This project has no end date and will continue to be living and dynamic for as long as the tools we picked will allow. Check back in next year or the year after to see how it grows.